National bestselling author Amanda Flower returns with her second floral Magic Garden mystery, perfect for readers of Paige Shelton and Sheila Connolly. 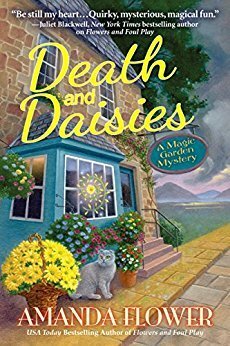 Death and Daisies by Amanda Flower is the second book in the cozy A Magic Garden Mystery series. Each book of this cozy mystery series has it’s own mystery to be solved within the book so they could be read as a standalone if choosing to do so. However the characters personal stories do carry over from book to book so reading in order is always best. Readers were introduced to Fiona Knox in the first book of the series when she got a call from a lawyer in Scotland informing her that her godfather had passed and she would be inheriting his estate. Within days of receiving the call Fiona’s fiancé ran off with the cake decorator and her flower shop went out of business so what better to do than hop on the next flight to Scotland and claim her inheritance. Now Fiona feels like she’s getting her life back on track in Duncreigan, Scotland becoming the caretaker of her godfather’s magical garden and cottage and opening her own shop. However, the parish minister Quaid MacCullen is not a fan of Fiona and the magical garden she’s inherited and makes that fact well known so when he’s found murdered Fiona ends up a suspect and needing to clear her name. While I haven’t been able to catch up with all of Amanda Flower’s cozy mysteries I have however really enjoyed the ones that I have read and this was no exception. This series takes readers to Scotland and mixes in a touch of magic making it a unique read but along with likable characters and a solid mystery it’s definitely a series I’ll keep coming back to to see what else is in store. Amanda Flower, a USA Today bestselling and Agatha Award-winning mystery author, started her writing career in elementary school when she read a story she wrote to her sixth grade class and had the class in stitches with her description of being stuck on the top of a Ferris wheel. She knew at that moment she’d found her calling of making people laugh with her words. She also writes mysteries as USA Today bestselling author Isabella Alan. In addition to being an author, Amanda is a librarian in Northeast Ohio. This is her second Magic Garden mystery. Nice review Carrie. I also love any of her books that I have read. I recently saw that she is giving up her job as a librarian and going into writing full time. I have not read either in this series, but I probably should, you know I usually agree with you on cozies. I know, I was surprised to read that in her newsletter. That is true, I will be in the same boat.